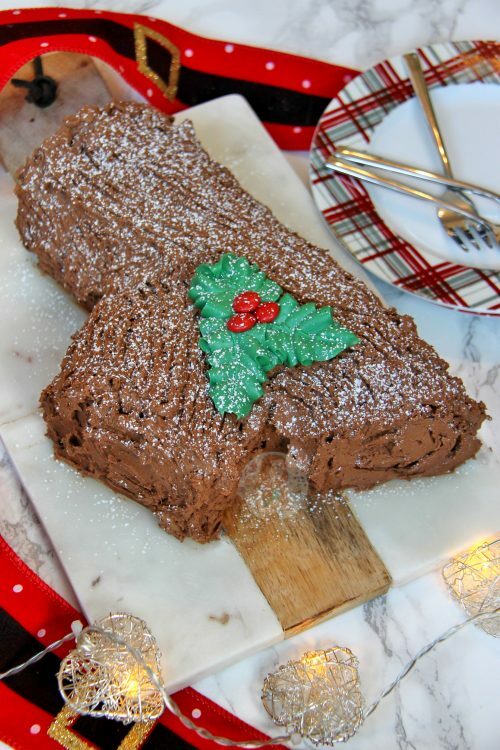 A Chocolate Bûche de Noël Cake decorated with utterly delicious Chocolate Frosting – Perfect Chocolate Cake for the Christmas Season! 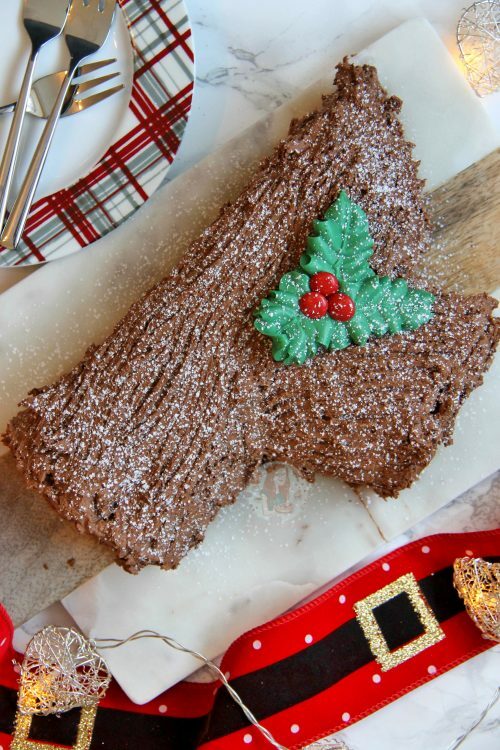 I have had so many requests for a Yule Log recipe that I literally can’t count them any more – so I decided, this is was a must recipe for Christmas this year! 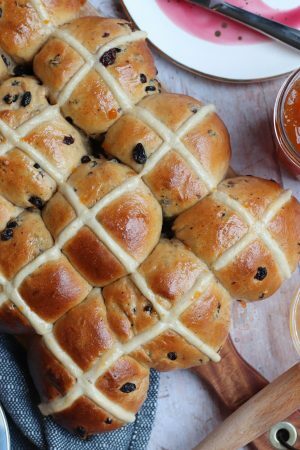 The absolutely WONDERFUL thing about this recipe, is that it is moist, delicious and is naturally Gluten-Free! 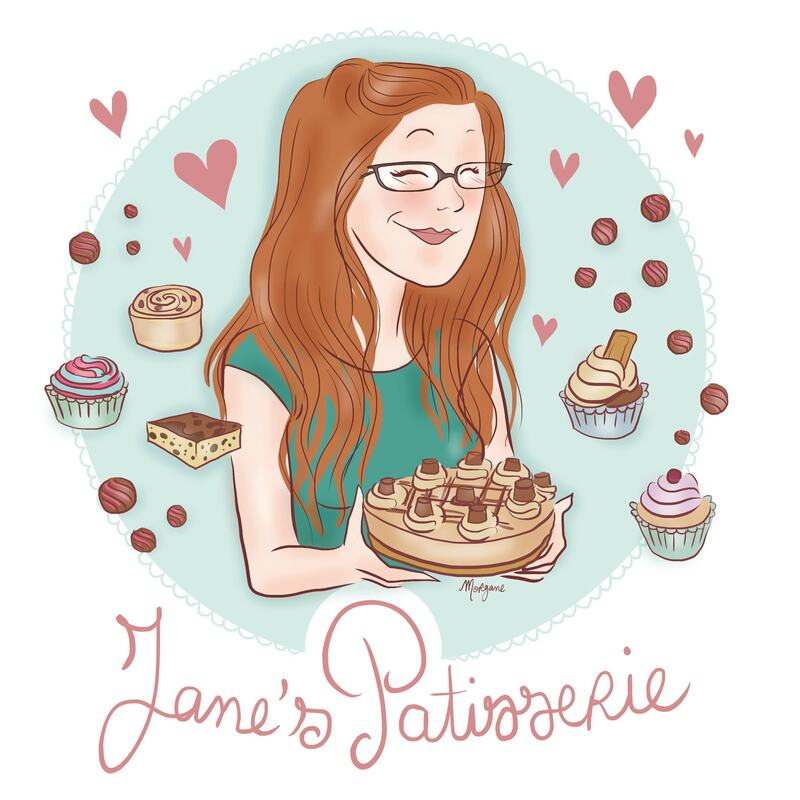 Thats right – no gluten containing ingredients so everyone can enjoy it! The recipe for the cake is made up of very few things, but works like an absolute dream. 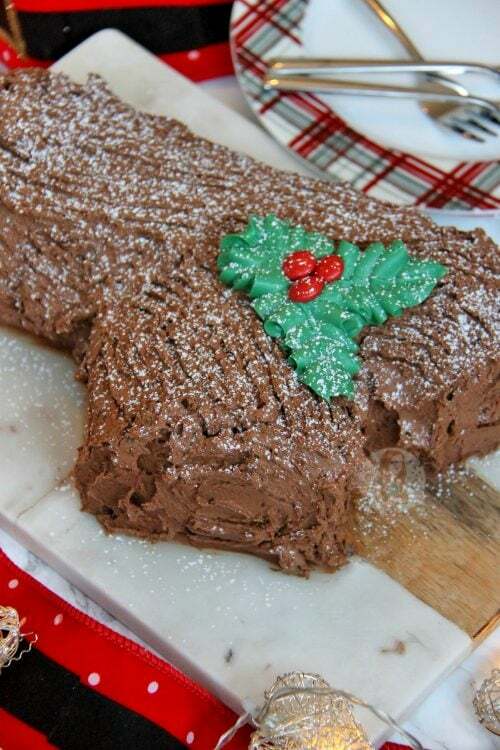 I have made swiss roll recipes in the past and they have been rubbery, or a little tasteless.. but this really isn’t. When the cake had finished baking, it had ballooned up quite a bit as it had so much air in it that I popped them with a cake skewer – but this was evidence of the fact that I hadn’t knocked out the air when folding my mixture together – and it is totally worth it. The cake is so chocolatey, moist, and stays good for days compared to going rubbery after a few hours like other recipes I have found! The Chocolate Frosting is made with melted dark chocolate because I wanted a deeper coloured Frosting compared to when its made with cocoa powder, and it worked an absolute treat. The Frosting is smooth, rich, sweet, yet not heavy when you eat it! Its the perfect frosting for such a cake, and it looks great too! When I decorate this recipe, I always roll my cake from the longer edge, to the longer edge… this means its long enough to decorate and create the second brand like I have done in the picture.. however, this does of course mean there is less ‘layering’ you could say as there is much cake to roll up! So, if you prefer more rolls in your cake, do it the shorter way! 1) Preheat your oven to 220C/200c Fan and Line a 23cmx33cm Swiss Roll tin with parchment paper. I find its easier to grease the tin so the paper sticks – leave to the side. 3) Separate the eggs into two different bowls, yolks in one, whites in the other. Add the Caster sugar to the Egg Yolks and with an electric whisk, whisk until light and creamy (may take 2-3 minutes). Once mixed, fold through the cooled Chocolate. 4) In the other large bowl, whip up the egg whites with a CLEAN whisk until they form stiff peaks. Don’t over-beat them however as they can go dry and then deflate – they will be unusable then. 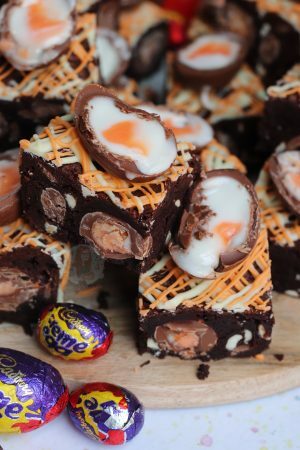 5) Mix in two spoonfuls of the egg whites into the Chocolate/Yolk mix so that it loosens the mixture – then carefully fold through the rest of the egg whites as carefully as possible – once combined, carefully pour into the prepared tin, and bake in the oven for 12-14 minutes. It won’t need any longer as it may start to catch! 6) Once baked, get a clean Tea-Towel and liberally dust with icing sugar – flip the cake over onto the Tea towel so the top of the cake is face down onto the icing sugar covered towel – peel off the paper and roll the cake from the longer side, to the longer side (including the towel) so that the rolled cake is longer and thinner, not short and fat! Doing this means it will be far easier to roll again later & decorate. Leave the cake to cool fully in the towel sausage! 7) Once cooled make the Frosting – melt the Dark chocolate and leave to cool slightly. Beat the butter & Icing sugar together till smooth, then add the vanilla, and fold through the cooled melted chocolate. 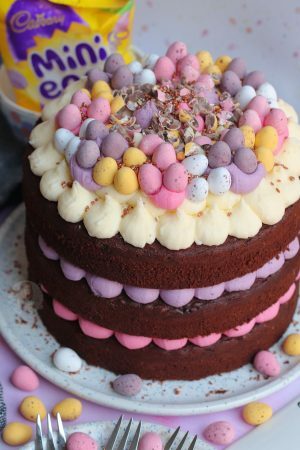 8) CAREFULLY unroll the cake again and spread a couple of spoonfuls of the frosting onto the cake, and roll back up – it doesn’t matter if it cracks as this will be covered up! At an angle, cut off a few inches of the end of the cake and sit it next to the rest of the cake (like shown in the pictures!) 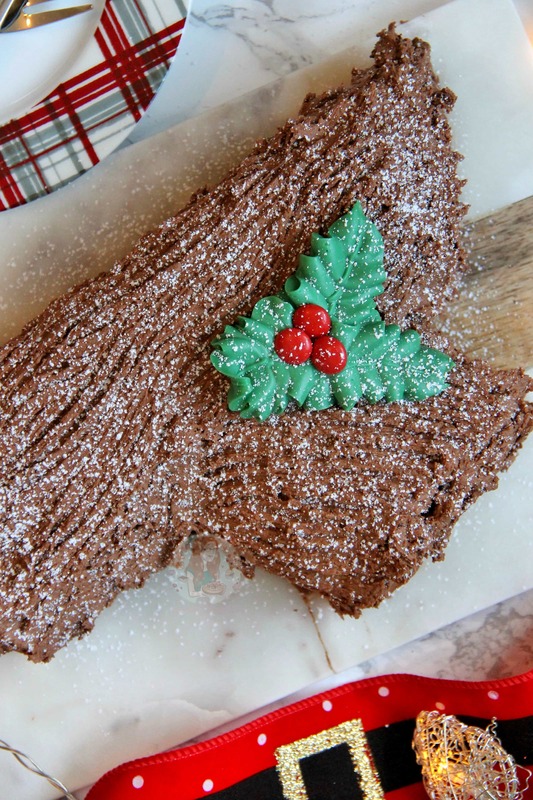 Cover the cake with the rest of the frosting and create lines using a fork or a skewer so it looks like bark on a tree! 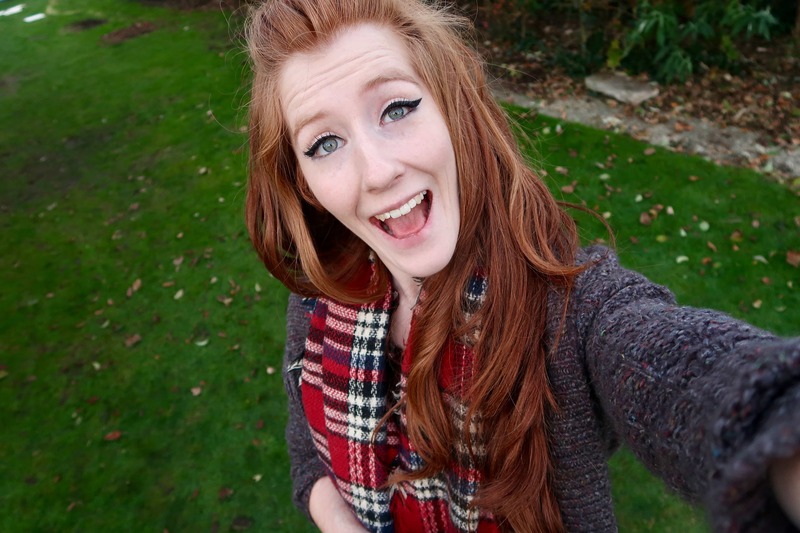 9) If you have any spare fondant lying around, make a little holly leaf – if not, it doesn’t matter! I used some leftover Green Candy Melts, melted them down and piped them on, and topped with three red M&Ms! Dust the cake with icing sugar and serve! The cake recipe is inspired by Paul Hollywood, the Frosting is my own! I find it easier to roll it when the cake is warm, but be careful not to burn yourself. If you roll the cake when its cold you might find its much harder and is more likely to crack. 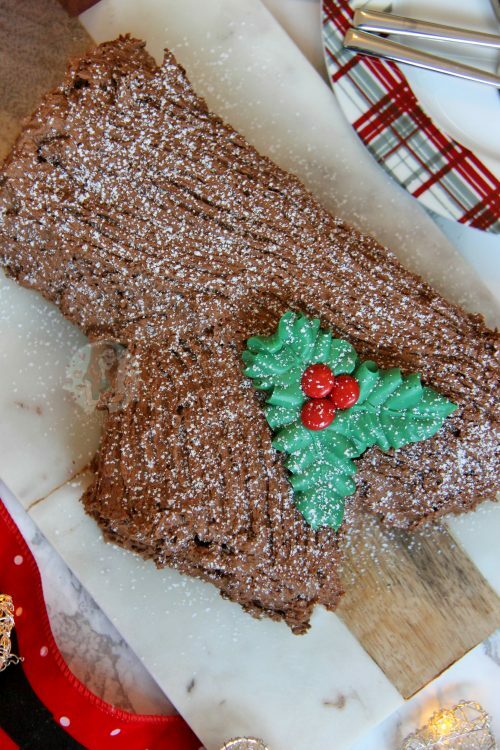 However, even if it cracks, you can easily just glue it back together with some of the frosting to form the log shape, and then still decorate as you won’t see the cracks once its decorated! I know the idea of putting water into the chocolate is a little terrifying – but it makes a delightfully thick ganache like chocolate. Just be careful with it – don’t over mix the chocolate if its melting over a Double Boiler, but if you’re doing it in the microwave and then adding the water after, beat like crazy so that its smooth! 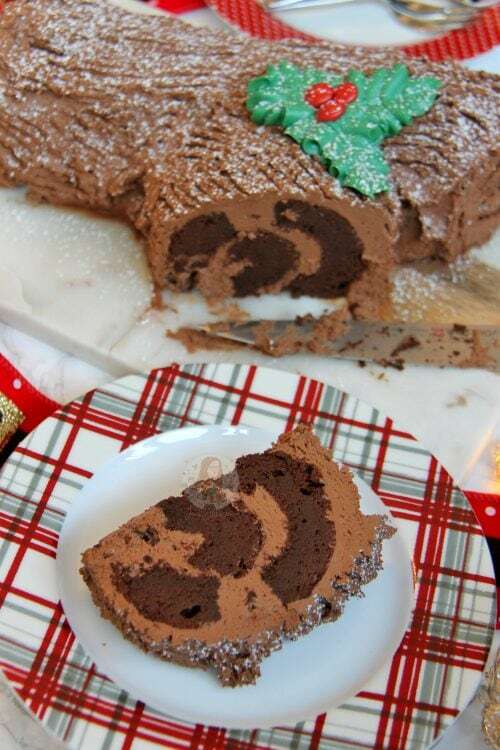 Find my other Christmas & Cake Recipes on my Recipes Page! Older Next post: Christmas Pudding Chocolate Truffles! Newer Previous post: No-Bake Terry’s Chocolate Orange Tart! is there a reason for the long thin roll VS the short fat roll? I feel like I would want more of a swirl in the middle? ALSO, can I use white chocolate for the filling? (just to add more contract from the swirl and cake and outside frosting?? would the measurements be different for white chocolate? The short size will just be really very short, so you can’t shape it much at all (classically yule logs are always longer to shape). And do you just mean melted white chocolate?? Ooh so for a buttercream, yes it should! Is there no flour at all? I’m concerned it’ll just be a rubbery chocolate omelette? No, there isn’t. Follow the recipe as is. I always was taught never to add water to chocolate because it would cause the chocolafe to seize. Otherwise, your cake looks adorable, yummy and whimsical! That rule only applies when you’re adding a small amount, such as even one drop. However, if you add enough, it doesn’t matter and creates something quite wonderful!